Syn Tai Hung’s is principally engaged in the trading and distribution of building materials for the construction industry, from basic items such as cement products, ceiling boards, reinforcement bars, wire mesh to architectural items such as tiles, ironmongery, sanitary wares, roof trusses and tiles, insulation material, GI sheets. Syn Tai Hung’s portfolio also includes a wide range of timber and clay products, cement additives and chemicals. 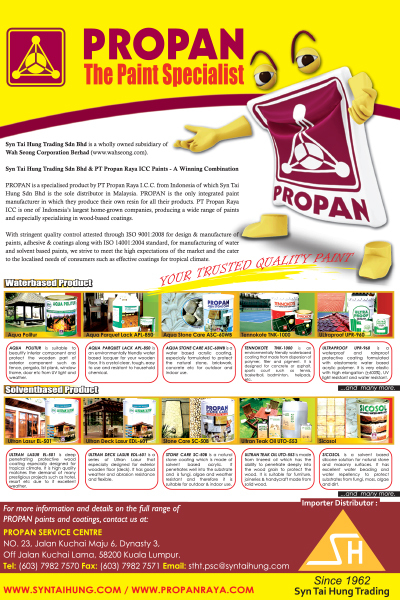 PROPAN is a specialised product by PT Propan Raya I.C.C. from Indonesia of which Syn Tai Hung Trading Sdn Bhd is the sole distributor in Malaysia. PROPAN is the only integrated paint manufacturer in which they produce their own resin for all their products. PT Propan Raya ICC is one of Indonesia’s largest home-grown companies, producing a wide range of paints and especially specialising in wood-based coatings. Propan Service Centre is a dedicated training and retail centre where we conduct free product knowledge and application sessions to professionals across various trades such as painters and specialist contractors, developers, dealers, architects, interior designers, landscape architects, quantity surveyors as well as home owners and end users. With stringent quality control attested through ISO 9001:2008 for design & manufacture of paints, adhesive & coatings along with ISO 14001:2004 standard, for manufacturing of water and solvent based paints, we strive to meet the high expectations of the market and cater to the localised needs of consumers such as effective coatings for tropical climate. For more information and details on the full range of PROPAN paints and coatings, contact us at the above address.